In 2015 the Edinburgh International Festival began a three year partnership with Castlebrae Community High School supported by City of Edinburgh Council, with the ambitious aim of supporting the improvement of the school. Thursday 14 December marked the opening of the Castlebrae Portrait Project 2015-2017, a permanent installation of photographic portraits which is a lasting legacy of the International Festival’s relationship with the school. Edinburgh based photographer Aly Wight, set up a photography studio in the school each year and invited every pupil in the school to have their portrait taken. Designed as an alternative to traditional school photographs, the pupils were asked to think about something that was happening in their lives at that time and decide on the precise moment at which the photograph would be taken. The resulting images document change and growth for each pupil over the three years of the residency. Watch the video to hear from the pupils, staff and other people involved in the project. Norma Prentice, Castlebrae Community High School Head Teacher, said: ‘Throughout the residency and International Festival involvement with Castlebrae over the last three years, we have felt the true meaning of partnership working. The vision of both the Festival team and staff at Castlebrae was to ensure the best for our pupils. Through their commitment, creativity and passion for Castlebrae, this has certainly been achieved’. Councillor Adam McVey, Leader of the City of Edinburgh Council, said: “The Council’s partnership with the Edinburgh International Festival has provided an unforgettable opportunity for our Castlebrae pupils. “Many people may be surprised how active the festivals are outside of August but this project is a prime example of the International Festival supporting our local Craigmillar community. 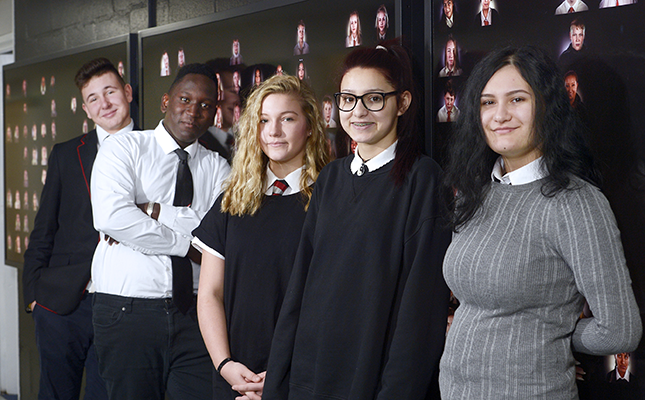 It really has been a great learning opportunity for these young people, who could well become our city’s future festival directors, producers, artists or crew members, and this new portrait project exhibition will serve as a fantastic reminder.